in Salinelle's Chapel and at Studio Pendragon. 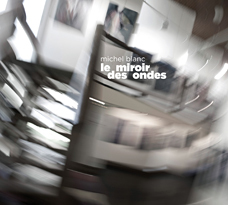 Comprised of twelve musical parts, Le Miroir des Ondes was composed around and from various news events that occurred between 1972 and 1989. With it, Michel Blanc wanted to translate into music his own feelings about some events that crossed his life at the time, with the idea to convey to the listener a sound space that could penetrate his/her imagination, whether or not he/she would be aware of the events. The choice of instrumentation for this project is based on major musical aesthetics of the time, namely: contemporary music, rock, concrete music and improvised music, and jazz derivatives.